In Viking & Dragon, Novomatic transports you to a mystical land. The backdrop to the game looks so real it could be a photograph! The grass is thick and lush, the trees are ancient and tall and the mountains look ready to explore. This is the home of the Vikings and the Dragons and boy does it look incredible. So verdant and full of life! It’s also full of treasure, which is why we are sure you’ll enjoy playing this game. The symbols are treasure, the bonus features are treasure and you can win actual treasure! The Vikings ruled Scandinavia many centuries ago. They were seafaring Norse men who loved to steal treasure and pretty girls. In fact, legend has it that Scandinavian women are so beautiful because the Vikings stole all the pretty girls from neighbouring countries. While it’s not true that the Vikings actually had dragons as pets or companions (as dragons aren’t really real), they did appear often in Viking stories, myths and folklore. 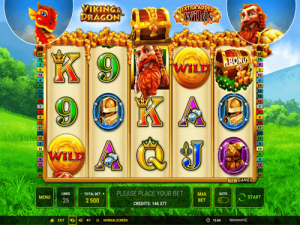 In this Novomatic video slot, the dragon doesn’t play as big a part as the Viking. But it is a very cute dragon! It’s red and yellow with big, cheeky blue eyes. Viking & Dragon has 5 reels, 3 rows and 25 paylines. The average payout percentage is 95.05%. Anyone who plays these other slots from Novomatic are sure to enjoy Viking & Dragon: Secret Elixir, Dolphins Pearl, Eye of the Dragon, Lava Loot, Dragon’s Deep and Elven Princess. The dragon isn’t actually a symbol in this game and it only comes to help during the Free Spins. The Viking is a symbol and, actually, he’s the symbol that awards the biggest payouts of all! In descending order, the other symbols are: the Viking hammer and Viking sword, the Viking helmet and Viking armour, the King and Ace, the Jack and Queen and the 9 and 10. Payouts will vary according to your bet, how many matching symbols you spin and which matching symbols you spin. Each symbol has a payout value for 3, 4 and 5 matches. The Viking also has a payout value for 2 matches. To get the payout, the matching symbols must land on a payline, starting from reel 1 and following on adjacent reels. Viking & Dragon as 25 paylines which are fixed (you can’t bet on fewer than these 25 paylines). Adjust your bet easily by increasing or decreasing you ‘Total Bet’ (your 25 lines multiplied by your bet per line). Gambling is possible in this game, which will be music to the ears of all your risk-takers out there! There are really some magic symbols but the bonuses aren’t mythical – they’re most definitely real! The magical symbols are the Wild symbols and the Bonus (scatter) symbol. The Wild symbol is a golden coin and the Bonus symbol is the treasure chest filled with the golden coins! The Wild golden coin symbol can behave like any other symbol and it gives out wins for 2, 3, 4 and 5 adjacent matches on a payline. If it helps to complete a winning set of symbols, the Wild golden coin symbol can also behave like a substitute for any other non-magical symbols (the card values, the Viking and the Viking’s sword, hammer, helmet and armour). The Bonus symbol pays in Scatter for 3, 4 and 5 matches. Paylines mean nothing to this treasure chest symbol! 3 Bonus symbols gives a payout and 8 Free Games. 4 Bonus symbols also gives a payout and 12 Free Games. 5 Bonus symbols give the biggest payout and 20 Free Games! During the Free Games, you might be lucky enough to get additional Free Games with win multipliers if you spin more Bonus scatter symbols. During the Free Games and the normal games, the Extra Wilds feature can be triggered at any time! In the normal game, the Viking adds the Wilds to the reels and during the free games the Dragon adds the extra Wild symbols to the reels with his fiery breath!